In February of this year, I was visiting my friends Mika & Koji in Chiba, which is about an hour and a half away east of Tokyo. The traditional Japanese way is for the family unit to remain very tight throughout the lifespan; it’s common for newly married couples to live with one set of parents for a good while, and for their respective families to spend a lot of time together as a unit. So, when I visit them, I also visit their parents, siblings, nieces, nephews and in-laws. It’s always a delight. They’re all such open, honest, loving people. I was thinking to myself, why don’t I come here more often? Mika telepathically understood this, and suggested we start an informal English class for her two school-age nieces and their friends. Great idea, I said. The class would be held every Friday, but I would only teach every second week because it would be a bit expensive paying my costs all the time. And so it was, from March up until last Friday when we held our final class & party. This Friday class (or classes, as we had two groups of six children), however, has been the highlight of my fortnight for just this reason. 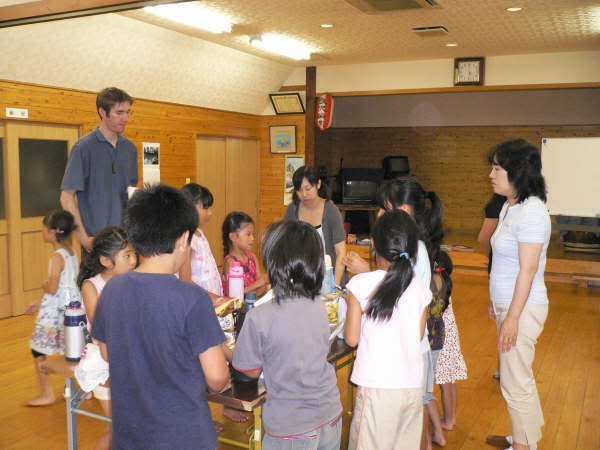 The kids were all brilliant (and impossibly cute), I was ‘Barnaby-sensei’ but as much their mate as their teacher, and Mika was a wonderful person to teach with and just generally be around. When it came to that farewell deal last week, I was really sad that it was ending. These kids, these people, really meant something to me and I would miss them. Still, it was rowdy fun like it always is – plenty of laughter and a good amount of craziness. Most of their parents had turned up to see how I’d indoctrinated their precious little ones. Each one of the children stood up and did their little self-presentation, something they’d studied for pretty hard by the sounds, and they all nailed it as though it was second nature. Mika said they’d struggled the week before. Not this time. I couldn’t stop grinning, they did so well. 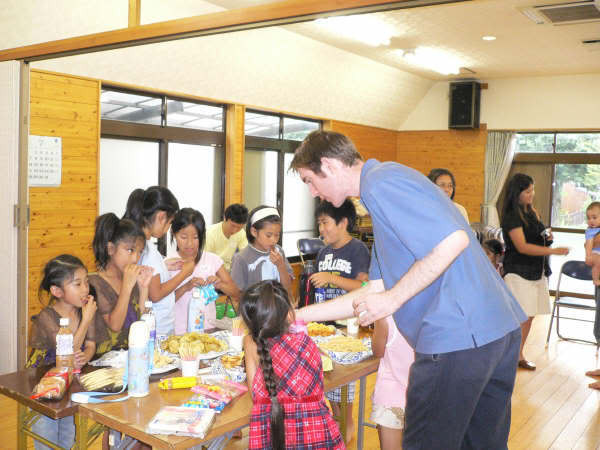 Then we set up a table with food and drinks – typically unhealthy kids’ party fare, That’ll do would probably keel over at the sight of it – and Mika’s sister came over to us and gave us both a bag, saying ‘arigatou’. We’d been doing it for our own pleasure (and, let’s be honest, a bit of money in my case), but gifts? Well, thank you, OK. Inside were the items I will treasure for my entire life: a t-shirt with all the kids’ hands stretched out into a circle, and a huge card with a photo of each class and a handwritten message from each child (in Japanese). “Thank you for teaching me English.” “It was a lot of fun.” “Please come to Japan and teach us again.” “You’re always cheerful.” I sat there for about five minutes looking at the pictures and their messages, and had a quiet moment of reflection: if this is where your life has led you, this point here, this feeling, then you are doing something right and everything has been worth it. This soon-to-end time in Japan (more on that soon) has been challenging in many ways, and I’ve done my fair share of bitching about the place to friends and family and basically anyone who’ll listen, but even if there was nothing else to be pleased about – which there is in spades – I’d have this, and it would all be worthwhile. Then I realized I was being rude not talking to anyone, and played some games with the kids who had long since finished stuffing their faces with crisps and were tearing about like… well, like kids. One girl from the younger class came running up to me, hugged my legs tightly, looked up at me with a huge smile on her face and said, “Daisuki!” (“I love you.”) Usually I’d laugh such declarations of affection from children as either attention-seeking or just being playful, but at the age she was, I could see she was pure in the moment and genuinely meant it. There’s a wonderful lack of pretence about Japanese children up to the age of about 8 or 9, before they’re aware of themselves and how badly they need to be exactly the same as everybody else their age, immediately. They just do and say what they feel. Needless to say, I was touched. When it was all over, I went and had sushi with the family, and played loads with M & K’s nephew who was too young to join the class. At the end of the day I made the long(ish) trip home, tired and very happy. Mika sent me a text saying she thought we’d had a good experience. I sent her back a slightly overdone essay about it being my best memory of Japan and a group of people I’ll never forget. Not unlike this, I suppose.